A few of these have emerged around Hebden Bridge in the last couple of weeks. Businesses that occupied premises that were damaged in the flood have been invited to set up shop (literally) where they can. 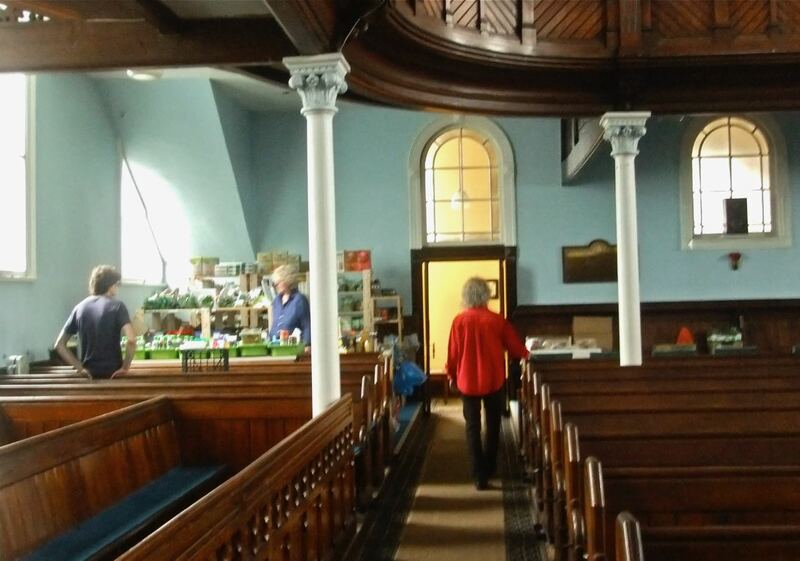 They’re calling them ‘Pop-up Shops’ round town., The main road, Market Street, is still a dead zone – about 3 out of 20 shops open – but one of them, Valley Organics, has a temporary home in the Hope Baptist Chapel, pictured here. It doesn’t have electricity at the moment, as the chapel’s cellar was also flooded on both 22/23rd June and 9th July, but it’s a start. I’ll tell you one thing – a disaster like this sure helps you see who your friends are (yes, we’re looking at you, Punch Taverns). Hey, it’s August. My birthday’s in August. That means I’m coming to the end of the first year of this blog.